Some things to keep an eye on today in racing. – Chase berths. Five drivers can clinch spots in the upcoming Chase for the Sprint Cup Championship today at Michigan International Speedway. They are five-time Cup champion and current series points leader Jimmie Johnson, Greg Biffle, Matt Kenseth, Dale Earnhardt Jr. and Brad Keselowski. Johnson can clinch if he is 145 points ahead of 11th place after today’s race. He currently sits 124 points ahead of 11th and would clinch at least a wild card spot with a win today. Biffle has a 123-point lead over 11th place, followed by Kenseth (122 points ahead of 11th) and Earnhardt Jr. (107 points ahead of 11th). Keselowski can clinch at least a wild-card spot with a win today, depending on how a number of other drivers finish. Johnson and Earnhardt will start today’s race at the rear of the field after making engine changes. The Chase will be just three races away after today’s 400-miler at the 2-mile MIS oval. – Wild card berths. 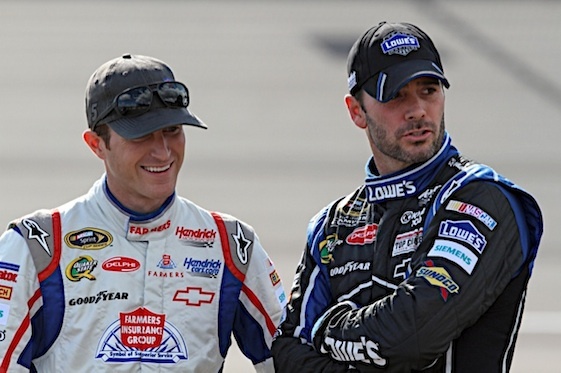 Five drivers could move close to clinching wild cards berths today in Michigan. Ryan Newman, Kyle Busch, Jeff Gordon, Marcos Ambrose and Joey Logano can all improve their odds of earning one of the two wild cards for the Chase if they win for the second time this season. Kasey Kahne enters today’s race in 11th place in the series points and has two wins. He’s the only driver outside the top 10 to have two victories this season. Carl Edwards is 12th in points, but hasn’t won a race this season and would lose out on a wild-card berth to any of the five drivers with a win ranked below him in the standings. – Countdown berths. The NHRA is in Brainerd, Minn. today for the penultimate event before the start of the Countdown playoff. Half of the berths for the Countdown have already been bagged in the nitro classes. A bunch more can be secured in today’s eliminations. Top Fuel; 1. Spencer Massey, 2. Antron Brown, 3. Tony Schumacher, 4. Steve Torrence, 5. Doug Kalitta. Funny Car; 1. Robert Hight, 2. Ron Capps, 3. Jack Beckman, 4. Mike Neff, 5. Johnny Gray. Pro Stock; 1. Greg Anderson, 2. Jason Line, 3. Allen Johnson, 4. Mike Edwards, 5. Vincent Nobile, 6. Erica Enders. Pro Stock Motorcycle; 1. Eddie Krawiec, 2. Andrew Hines, 3. Hector Arana Jr., 4. Hector Arana Sr. In trouble vis a vis the Countdown are some notables. Such as Khalid Albalooshi (currently 12th in Top Fuel) of Al-Anabi Racing (the team that has produced the last two Top Fuel champions); defending Funny Car champ Matt Hagan (currently 11th) of Don Schumacher Racing. – The new surface at Michigan. The resurfaced track is a wild card in itself. It was super fast at the test that was held in June and the first race this season. Like, well over 200 mph fast. So fast that NASCAR knew something had to be done and, no, not implement use of restrictor plates. Goodyear responded by bringing a new, harder tire to the track this weekend. The harder tire forces drivers to eas off in the corners. The problem is that the hard tires have not been rubbering up the track. With a lack of rubber on the surface, the racing groove has shrunk. Bottom line: Michigan could be way less Michigany today. – Tony Schumacher starts today’s NHRA event in Brainerd today from P1 in Top Fuel. Should he go on to win the event, count on some of his peers to do some howling. Schumacher is using the covered-cockpit which he and his Don Schumacher Racing organization helped to develop and which was approved for use this past week. A number of other Top Fuel organizations have said that the canopy, though billed as a safety improvement, actually makes the cars more aerodynamically effieicent and, hence, faster. Not all of the teams have secured the canopies, which are available from just one company. In fact, Schumacher is the only driver using the canopy at Brainerd. So, if he wins, howling will ensue. When the howling subsides, orders will be placed for the canopies en masse as the next event on the schedule is the all-important U.S. Nationals in Indianapolis.